“Yuca (cassava) is a starchy, tuberous root that originated in South America, most likely Brazil, and has probably been cultivated for 12,000 years. Today, Africa consumes the most yuca, with Nigeria being the world’s largest producer of the root. When dried, it becomes tapioca. Quite a handy root, eh? According to the great and all-knowing internet, when selecting a yuca/cassava you should choose firm tubers with no blemishes and a clean fresh scent. Personally, I just grabbed one that looked nice. Peel and slice the yuca up into large slices, discarding any soft spots. Place in a pot and fill it with cold water. Bring the pot to a boil and gently boil for about ten minutes, until the fries are easily pierced with a fork. Be careful not to boil them too long; they start to take on a gelatin-like gooeyness if overcooked. 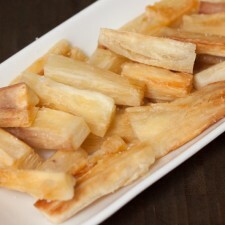 Let the yuca drain for a few minutes while you warm up the oil in a pan on med/high heat. I had heard great things about Kelapo’s coconut oil, and they were gracious enough to send me some product to try for myself. This oil had a very mild, light taste and excellent aroma that perfectly complemented the yuca fries and gave them an extra hint of tropical flavor. Kelapo was also nice enough to give me a coupon code to share with you, my dear readers, so you can try their stuff out yourself! Just use the code “DomesticMan20” during checkout to get 20% off your order, from now until August 24th, 2012. Pretty awesome, huh? Okay, back to the recipe. 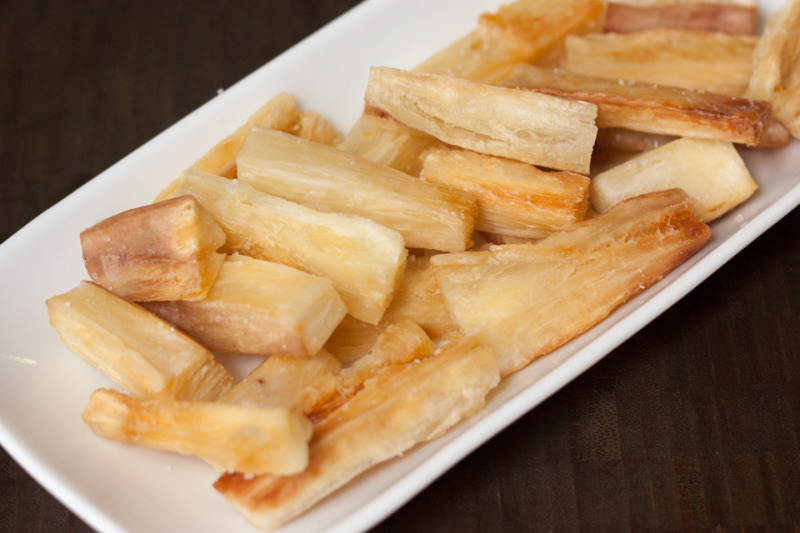 Pan-fry the yuca, rotating the fries every few minutes, until crispy and golden brown. Should take about 10 minutes altogether. Place the fries on some paper towels, and sprinkle with a little salt.